Application: I Don’t Give a Rotterdam went on smoothly and was opaque in two coats. It was a little thicker than expected, but it wasn’t unworkable at all, it was just thicker than I prefer. 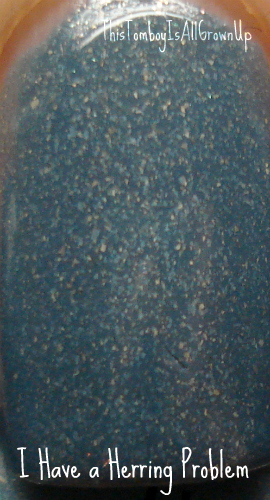 The Color: I Don’t Give a Rotterdam is lighter dusty blue, with silver, gold, and darker blue shimmer. Wowza! As I said, I love blue polish and this one did not disappoint. The Verdict: Yes, please. I have already worn I Don’t Give a Rotterdam a few times this summer and will be able to take it with me well into fall and winter because this is the type of blue can be warn year round. Me likey! Yes, I am back! While playing a little basketball a few weeks back, tragedy struck! Okay, it wasn’t a full on game of basketball, but rather one of those miniature two player games where you shoot to see who can make the most baskets at the arcade. The good news is I won, but sadly in the process, I broke one of my nails! There was no way to fix it, so I had to drop off the face of the planet. Well, thanks to fast growing nails, I’m back, baby! Time to celebrate with a little gray jelly action. P.S. You can still see a little damage to the nail as it is slightly more rounded. What can I say, I tried! The Application: My Pointe Exactly went on perfectly. At first I was concerned that there would be major streaking which tends to be a big problem with sheers. Well, at least for me it is a problem, but with My Pointe Exactly, it was a none issue. It did take three coats to get the desired effect I was looking for. OPI’s Ballet Collection in general is fabulous, but if you have any staining on your nails, it will most likely show with this collection as it peeks through the polish. My Pointe Exactly is the exception. As for Pirouette My Whistle? The application was slightly trickier as the glitter was a little hard for me to get on the brush at first. The best way to make it work for you is to hold the bottle upside down briefly and then go for that fabulous glitter. Totally worth it! The Color: My Pointe Exactly is a gray jelly with a tad bit of blue. 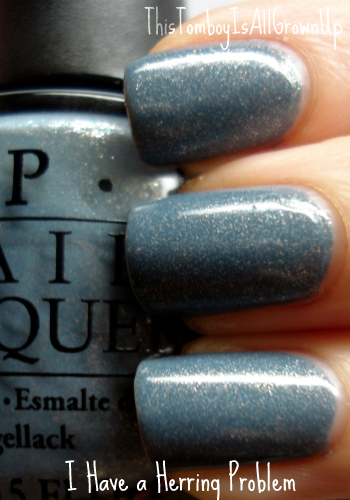 Yes, I said it, a gray jelly which is not easy to find in the nail polish wild. Well, congrats, OPI made one just for you! 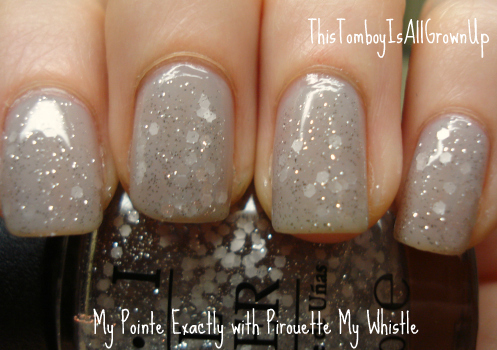 Pirouette My Whistle is a clear based polish comprised of small silver glitter and larger hexagonal glitter. If you like glitter but are afraid of being obnoxious, step out of your comfort zone. Pirouette My Whistle is dainty and very understated for a glitter. Fabulous! The Verdict: My Pointe Exactly is amazing! It’s the perfect shade of gray for the cool skinned girls out there. Usually, grays look questionable on me, but thanks to the hint of blue, this puppy is just right! If you are not a fan of sheers, My Pointe Exactly will completely change your mind, along with the rest of the rest of the collection. Pirouette My Whistle is gorgeous, it really is! This is one glitter that most can agree on, even those who find glitter to be a little gaudy at times (that would not be me, wear it loud and proud, I say). It’s pretty, understated and can jazz up any polish out there for a fantastic finish. Be prepared. I have used Pirouette My Whistle on another one of the colors in the collection but didn’t photograph it thanks to the hideous break in my nail at the time. It’s a bit of a pain to remove, so be prepared and find something mindless to watch on TV so you don’t get annoyed. 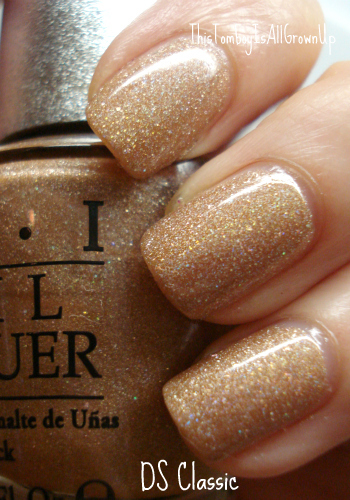 All in all, I am really pleased with OPI’s Ballet Collection and can’t wait to review more. For someone who doesn’t normally like neutrals and sheers, this collection is pure win in every way! Just be prepared to buff your nails if you have any stains, otherwise, they will show up under the more light colors of the collection. If you are too lazy, than go for My Pointe Exactly, it covers a multitude of sins! Don’t forget Pirouette My Whistle! There’s a monsoon out my window! Back and forth between cool weather and warm weather. Back and forth! What’s a girl to do when changing her polish. It feels like vampy weather but I’m ready for spring. How about a red polish which works for any season. Heck yeah! The Application: Perfect! I have to be honest, it’s pretty rare when I run into an OPI that doesn’t have a great formula and DS Reflection was no exception. Perfect consistency and completely opaque in two coats. DS Reflection was almost a one coater for me , but I always do two just to be on the safe side. 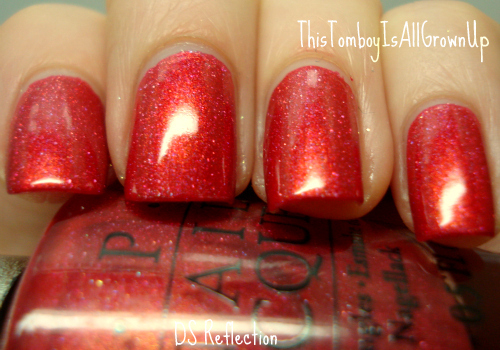 The Color: In the bottle DS Reflection looks more red then it does on the nails. Even in the photos, it looks more red then it is when applied. It’s a hard color to describe. It’s more of a pinkish, red with orangish undertones. Strange, yes and a total disaster for a cool toned girl like me. 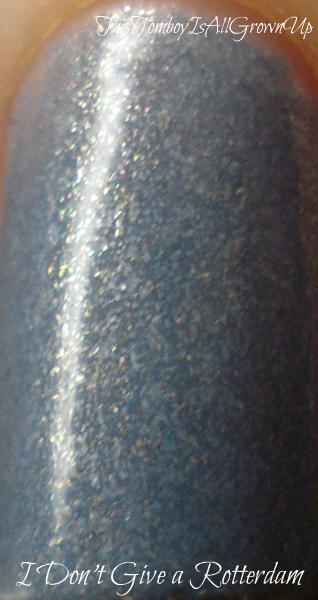 The plus side is that it has various pink, red, and blue scattered holo in the mix making it unique. But don’t think you’ll be getting a strong holo effect as it very minimal. The Verdict: I have to be honest. I removed it the same night I put it on. The color was too dark red, orange for me. This type of color will never work on me but would be perfect for the warm toned gals out there. The formula is perfect and I’m sure the wear time is fabulous, but this is just not my type of red. 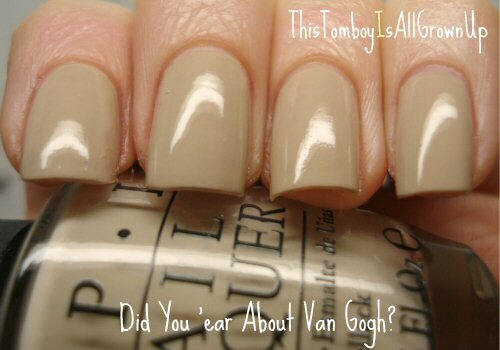 OPI Did You ‘ear About Van Gogh? Application: No complaints here! 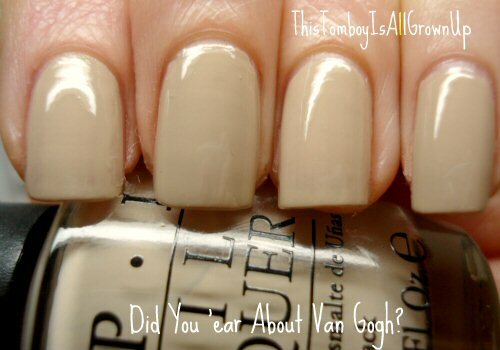 Did You ‘ear About Van Gogh went on smoothly and was not too runny and not too thick. Just right! It also was perfectly opaque in two coats. Sweet! 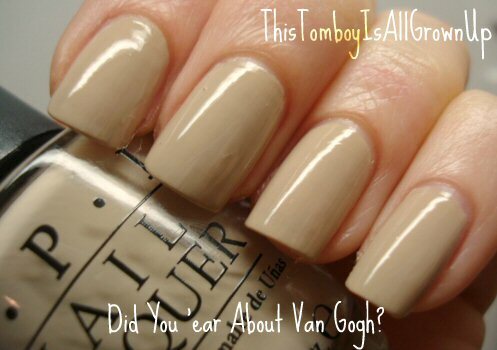 Color: Did You ‘ear About Van Gogh is described as a sandy bisque. Hmm, makes me think of yummy, yummy soup. Actually, it is reminiscent of clam chowder with a little drop of green. This would be great on someone with warmer coloring or someone with a nice tan. I have neither! It doesn’t look horrid, it’s just not, “wow” either. Verdict: Don’t love it and I don’t hate it. It doesn’t look horrid, it doesn’t look great. Yeah, I know. Not very helpful, but I mean well. I guess I find it a little boring. Would I wear it again? Sure! Would I grab for it often? No. I have seen better whites out there, but this one will definitely please many. I can’t stay away from my blues for long. Especially now that I know The Walking Dead is over for 6 months, that brings me sadness. Maybe I should change this blog to the Walking Dead Blog with the way I’ve been going off about it. No, instead I will go into my Blue Period a la Picasso and tell you about I Have a Herring Problem. No, I cannot make this stuff up, that is REALLY the name (groan)! The Application: I have heard of people having problems with this collection due to poor formulas. I have to be honest, I have not seen this at all so far. Maybe I got a good batch, because the application of I Have a Herring Problem was absolutely perfect! It was perfectly opaque in two coats. 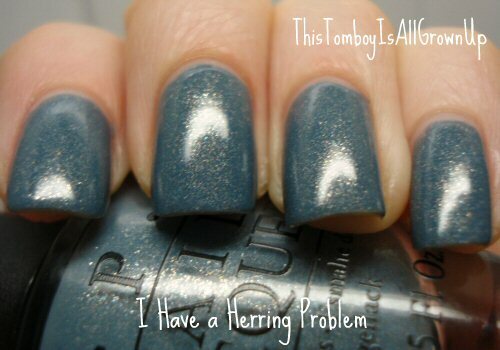 The Color: I Have a Herring Problem is a slate blue color with various sizes and shades of silver throughout it. I love blues and this puppy did not disappoint! Though for a cool tone girl like me, this blue did not pop like most blues do on my skin tone. So maybe this is a blue directed more towards the warm toned girls. Though I am not a huge fan of pinks like Pedal Faster Suzi, I figured I wanted to tap into my more feminine side this week. I have to be honest, it was kind of interesting timing considering I was enjoying a bloodier than usual episode of The Walking Dead at the moment of application. I looked at my nails waiting for them to dry before grabbing into my snack bag, and one thought came to mind. I would definitely miss my frivolous beauty products once the zombie apocalypse came, but having watched every zombie movie out there, I knew I would make it far. That and I live in NYC. If you can make it here, you can make it anywhere!!! Onto the polish! The Application: I have had really good luck with OPI polish lately thanks to long wear time and fabulous formulas. 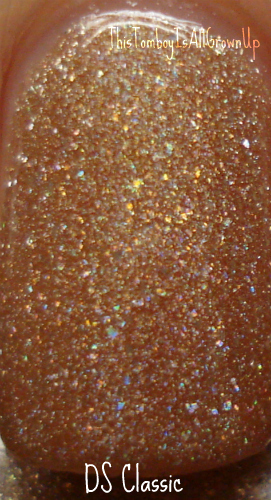 And as usual, the application for Pedal Faster Suzi was flawless and completely opaque in two coats. Yay! Again, the brush is either a good thing or a bad thing depending on your nail bed size. Mine are larger, so OPI’s wider brush brings me much happiness. If you have smaller beds, you may curse this brush silently under your breath. The Color: Where to start. Well, it’s definitely pink. For me, that says volumes. I am not a huge fan of girly pinks, because I am not a girly girl. I tend to like a little attitude in my pinks. Pedal Faster Suzi reminds me of the type of pink that Barbie would wear at some debutante soiree in the 1980’s. Thanks to Starz Comedy channel for that reference as I have seen my fair share of bad 80’s movies after a late night on the town thanks to that channel, and this pink would fit right in. No hate on the 80’s for anyone who loved the decade, but it’s not my style. Pedal Faster Suzi isn’t a straight up bubble gum pink as its chock full of silvery, white shimmer flecks, but I couldn’t get the thought of Pepto Bismol out of my head all week which made my stomach grumble. The Verdict: Many will love this color and that is perfectly okay. But personally, I don’t think I will be grabbing for this one too often. The formula is perfect making the application a snap, but I found the Pepto Bismol, bubble gum chewing Barbie Pink color to be too much for me. I kept getting distracted by the color during the week and returned to the same thought; this one is too dated for me. Also, the name. I understand OPI’s inside jokes with the names, but yikes. There will be many of you out there who will think I am off my rocker because you think it’s such a great color and you love it. And you know what? There is nothing wrong with that. Differences in opinion and fashion make the world go round and keep it from getting boring. But for this crazed ex-tomboy, it just didn’t work. I was feeling the need for something a little less flashy or vampy lately because I have been feeling a little sluggish and lazy lately. So I dug through my collection of neutrals and spied OPI’s DS Classic. At first, I wasn’t sure. Maybe it was too docile, but then I realized this was exactly what I needed. Sometimes, you just need something that’s a little less maintenance to get through the slow periods of life. The Application: Perfection! Truly! Every polish from the OPI DS Collection that I’ve tried has been as smooth as butter over fresh toast. Yum! Also, the polish is completely opaque after two coats. I’m also fan of OPI’s larger sized brush, but I have long finger beds. Someone with smaller ones may not care for it as it covers a lot of ground. 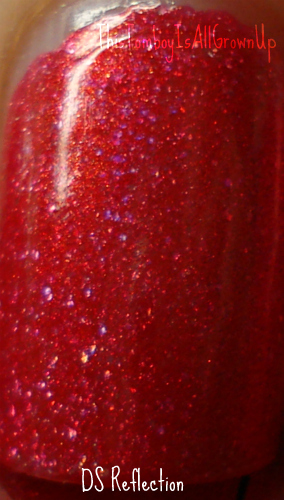 The Color: DS Classic is a cross between Butter London’s All Hail the Queen and Tart with a Hart. Though the glitter is more of a scattered holographic, multicolored glitter than Tart with a Hart. The base color is the perfect beige, neutral that would flatter many skin tones. What I love about DS Classic is that you can wear it for almost a full week and barely see any signs of wear thanks to the shade of the color making it very low maintenance. Exactly what I was looking for. The Verdict: Come on! No surprises here, I love it! It’s absolutely beautiful and easy to maintain. It even stood up to my vigorous PS3 shoot em up game that I rocked for 3 hours. The right side of my thumb always losses color quickly due to my video game obsession and typing but with DS Classic, I hardly had any wear even after six day. I highly recommend this one!